Applicator assists with easy and fast application, especially with long texts, working width of 610mm – 1700mm, solid construction. 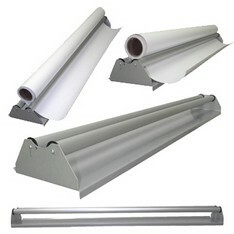 It helps you to place PVC and or application tape simple on weeded vinyl. Applicatiion tape goes straight without wrinkles or air bubbles, specially when you mask a 5m length vinyl or more, single person application. 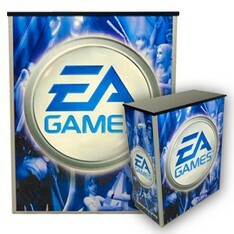 The Hologram Brochure Stand is a point of purchase display, signage that offers effective, eye catching appeal. 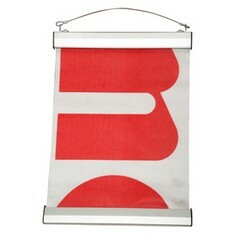 Such item for example can be used for in store merchandising and in exhibits for trade shows etc. The Hologram Brochure Stand comprises of a holographic top display with four stainless steel tiers: 300mm wide x 370mm high. Overall dimensions are 316mm wide x 320mm deep x 2020mm high – with or without full colour print. 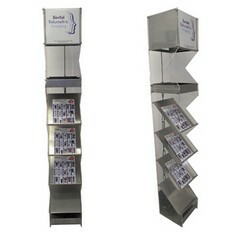 The Hologram Brochure Stand can be customised to suit requirements but subject to quantity. 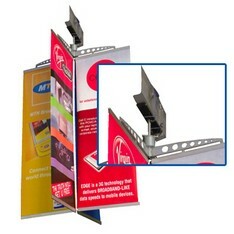 The Overhead Rotating Banner attracts attention by means of continuous 360 degree rotation – electrical motor driven. Allowing a maximum of four double sided printed panels that is overhead suspended for maximum exposure – with or without full colour print – fully collapsible and compact. The Point Of Sale Table is an aluminium constructed system, comprising of three display / support panels namely a face panel (780mm X 1000mm poster size), two side panels (380mm X 1000mm), a top tray and inner shelf which is epoxy coated in black colour. The system furthermore includes a carry bag and is supplied with or without full colour prints – fully collapsible and compact. Custom sizes are available on request although dependent on quantity.